Today, Nintendo announced a number of great things for owners of the Wii U and 3DS systems. So let's just jump straight into everything. First of all, a new Legend of Zelda game is coming to the 3DS. This is going to take place in the Link to the Past universe. 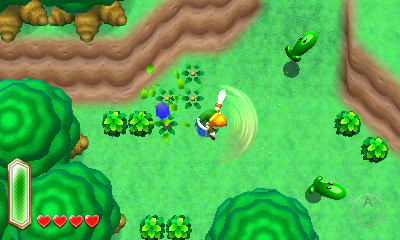 This game will allow Link to become a drawing and move along walls as well as use the 3D abilities of the 3DS. It is expected to come out this holiday season. Also coming to the 3DS in the Zelda universe is The Legend of Zelda: Oracle of Ages and The Legend of Zelda: Oracle of Seasons. These two games are interconnected so playing one game will unlock secrets in the other game. Expect these to hit May 30 via the eShop. Next up is a number of Mario titles. We have Mario & Luigi: Dream Team via eShop on August 11. In this game, Mario will have to go back and forth between the real world and Luigi's dream world to save Princess Peach. Mario and Donkey Kong: Minis on the Move where you place tiles on the bottom screen to guide the minis to their desitination on the top screen is expected on May 9. Mario Golf: World Tour is an online multiplayer golf game that is set to release this summer. Party Like it's the Year of Luigi is a new entry in the Mario Party series of games with seven boards, 81 new mini games, and a 30 floor tower climb, AR card games and StreetPass Battles. We should see this game come winter. The final announcement for this franchise is DLC for New Super Mario Bros. U called New Super Luigi U. You will need the original game to purchase this and it includes 82 udpated stages and new adventures that feature Luigi. We can look forward to this game in the summer. Oh yeah, also expect a new Yoshi's Island game some time. Did you feel that? It was like thousands of fan boys / girls just squelled for joy? What would cause that? Well there has been for years a single game that people have clamored for. A game that seemed like a no brainer for the Virtual Console. A game that goes for several hundred dollars on eBay. That game is EarthBound created by Shigesato Itoi and was originally released for the SNES in 1995. And this year it is coming to the Wii U Virtual Console. Now what else did Nintendo announce? They gave streen dates for Game & Wario (June 23) as well as Pikmin 3 (August 3) finally. A now availble Monster Hunter 3 Ultimate update that allows off-TV play via the Wii UGamePad. And finally Professor Layton, Animal Crossing, and Shin Megami Tensei 4 were all announced for the 3DS. It is good to be a Nintendo fan.